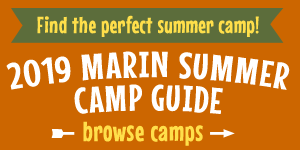 Marin Mommies presents a sponsored article from Mark Day School in San Rafael. Mark Day School’s newest summer camp, GoGlobal, brings a unique international experience to students ages 5-13. Half of GoGlobal’s campers are students from China who have come to Marin to learn English and learn about American culture. The other half are students from the Bay Area who want to learn Mandarin and dive into Chinese culture. For English-speaking students, GoGlobal’s Mandarin language program provides language instruction and conversation practice opportunities to students of all skill levels in a mixed-age class. Students will spend mornings in the classroom listening, speaking, reading, and writing Mandarin, and building Mandarin vocabulary through fun and creative activities. GoGlobal campers will go on two local excursions each week to Marin locations such as the farmer’s market, the Bay Area Discovery Museum, and Angel Island. There are several sessions to choose from, beginning July 8 through August 9. Visit www.markdayschool.org/summerprograms to register and for more information about Mark Day School’s other exciting summer camps.